Learn Simple Steps to Start Each Day with Power, Purpose, Focus, and Success! Not Giving God the First Fruits of Your Day? You Could Be Missing Out On Some Blessings! I believe a spending time with God helps us also to live with more balance as we take time each day to “just be,” which helps to break the cycle of constant activity. We can also live our lives more authentically because we take out the time to check in with ourselves and reflect upon the truest desires of our heart. Are you ready to start your day with joy and strength every single morning? Are you ready to feel the true transformation of what spending time with God brings? If you have been repeatedly saying, “I need to spend more time with God,” I believe A Date with God will take your daily devotional to the next level. God is looking for those who will worship him in Spirit and in Truth, especially in these end times. Our you preparing your heart for his return? Maybe you have thought about creating a quiet time or power hour with God but weren’t sure where to get started. A Date with God will guide you through the whole process. The thing I personally love about this devotional program is that each time I complete my power hour I feel renewed, refreshed, and empowered. Are you ready to release unnecessary baggage and begin each day restored, rejuvenating, and renewed? Are you carrying around the mental and emotional residue of yesterday, last week, or even last year? Have you been denying your feelings, hurts, and inner pain and brushing them aside or under the rug? Are you holding onto un-forgiveness of yourself or bitterness toward others? Do you yearn to break free from the weights and negative thoughts that plague your mind but don’t know how? God wants to heal you- body, mind, and spirit. He cares so much about you that he wants to see you functioning in a healthy mental state. He loves you unconditionally and is always eager to come to your aid when you need him. He is the Divine Father and nothing makes him happier than to look after his children. He didn’t give you your unique body, mind, and spirit with no intention on helping you maintain it. He wants you to rest in his loving arms. He says in his Word, Come unto me all who are burdened and have a heavy heart and I will give you rest…Cast all your cares upon me because I care for you. Did you know that almost ALL truly successful people start their day praying, meditating, visualizing and clearing their negative thoughts and limiting beliefs. They may also use this time with connect with God for guidance and studying His Word. Whether they call it a devotional time, morning prayer, quiet time, or a power hour, this time allows them to begin their day with power, focus, and purpose which all leads to success. John Kehoe, author of Mind Power Into the 21st Century, stated that one hour of spiritual training (meditation, silence, visualization, inspiration reading) was equivalent to 7 hours of actual working. Trevor Blake, author of Three Simple Steps, and creator of two triple-digit multi-million dollar companies contributes his success to three simple rule, 1) take control of his negative thoughts, 2) learn to generate winning ideas through spending time in silence or meditation, and 3) create an intention and eliminating all doubt that it will happen. Tony Robbins, author of Unlimited Power, and guru of self-empowerment, encourages anyone who wants to achieve to establish a daily power hour that includes movement, breathing, gratefulness, visualizing, speaking affirmations aloud, meditation, and prioritizing your work. How Can A Date with God Enhance Your Quiet Time with God? A Date with God is like a daily shower for the soul. . Each day you will come bare before the Lord and allow him to cleanse, heal, and purify your heart. You can turn your burdens, fears, and cares over to God in exchange for his peace, love, and healing. The Bibles tells us to put on the “full armor of God” so we can stand against the attacks of the enemy. Spending time with God will strengthen and fortify your mind and heart and prepare you for any problems that come your way. A Date with God Can Be Used With Your Favorite Daily Devotional! This is a wonderful book that outlines step, by step how to start you day full of power and purpose.The book is actually a journal as well which is wonderful. You can reflect as you learn to apply the steps that will take you on a wonderful journey of self-discovery and ultimately success! This is a great book, easy to read, practical, step by step instructions for spending an hour with the Lord. Believers who struggle with sitting in “the quiet place”, will treasure this book. I can’t wait to implement the strategies that Rhonda shares in this book. The charts and organizers are great tools to help me become more organized in my daily routine and to end procrastination! Thank you Rhonda for sharing this wisdom! I have gained some wonderful insight, on meditation, Bible study, and how to grow in my spiritual walk, and relationship with God. It’s going to take while to figure everything, but it will be worth it. My favorite part was the “Welcoming Prayer”. I only wish I’d had it back when I started working through the healing process, relating to childhood abuse. As a believer, I am always looking for ideas to make my time with the Lord more fulfilling. I consider myself a student of the Word, and while that is wonderful, I find it difficult to just sit quietly in God’s presence. The ebook, The Christian Power Hour, has given me, step-by-step, ways (and resources) to make my daily hour with the Lord much more powerful, meaningful, and transformative. My goal is to have my power hour first, followed by study time in the Word. I know they will complement one another. If your desire is to ‘Be still and know that He is God,’ this ebook is for you! Thank you, Rhonda Jones, for an anointed work. The instructional books will guide you through the 12 power hour steps. 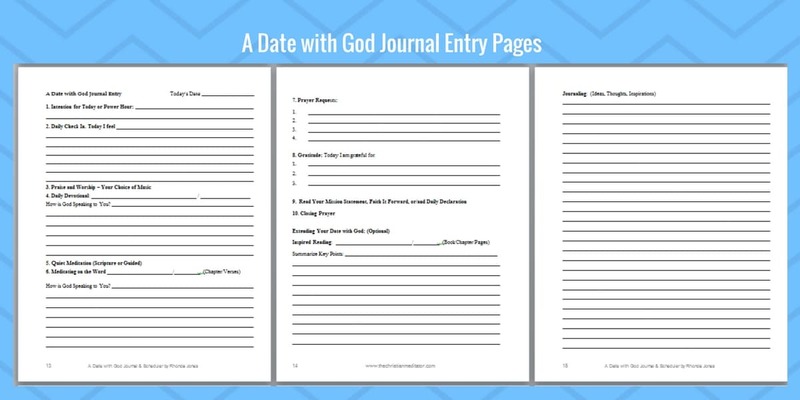 The journal templates, designed specifically for this program, provides you with a daily entries template associated with each of the steps. It also provides forms to write your mission statement and Faith is Forward entries. The planner helps you to organize your day and business with a daily scheduler, short and long term goal forms, project flow charts, and more. Creating your own mission statement. Daily declarations with positive affirmations and scripture to renew your mind and put your faith in action. Faith it forward stories that allow you to express your desires BEFORE they happen. Welcoming Prayer to help you work through anxiety and other toxic emotions. Does not include any guided meditations. Includes additional video instructions and tools. Prefer Hard Copies? Order from Amazon.